BetOnline is one of our preferred go-to brands for US friendly online gambling, including online poker action. BetOnline is legally sanctioned to provide gaming and betting services to players around the world, including those in the US. They are licensed out of Panama City, Panama, and subject to strict regulatory oversight that includes auditing of their compliance certifications, RNG technology and fair gaming practices. Their range of poker games and the quality of their performance have set them apart from the competition, along with their 25% lifetime match deposit bonus. This brand features a high quality casino with live dealer games, an industry leading racebook and sportsbook in addition to their top-notch poker room. Their poker room has been on the internet since 2004, but their parent company has even more experience with the industry, reaching all the way back into the early 90’s as one of the first sportsbooks to establish an online presence. Like most online gambling websites BetOnline has made the sign-up process effortless. The links in this page will direct you to the a designated page that welcomes you to the site and lists a special promo code for you to use. You simply click anywhere on the page and you will be taken to the designated registration page which will ask for your personal information such as your address and birthday, and will also prompt you to set up your password. Upon completing this registration, you will be sent an account verification email that contains your user ID and some information about using their site. Once you’ve logged in you will be directed to the deposit page where you can claim your welcome bonus and start your betting! With the poker software that they offer, make sure to get your user ID number to log in with. It will be located in your account verification email and in the upper right corner of the website directly adjacent to your name and under the “logout” button. It will be that obscure number that starts with a capital letter. The bonuses are typically one of the first things you want to look for when you’re looking for a new website to play online poker with. First, you will be given access to their welcome bonus, which is a 100% match bonus for up to $2500. This means that the poker room agrees to match your initial deposit up to a maximum of $2500. The bonus is released in $5 increments awarded as you play. The more you play, the more of your bonus is released into your account. Once you’ve made that first deposit you will also be awarded a ticket for a special tournament held every Sunday for new players. It’s the $5,000 New Player Freeroll. On top of those bonuses for new players they have a “$100,000 dollar Bad Beat Jackpot” that pays out to the table if your hand of four Jacks or better gets beaten which is something that got me personally excited. BetOnline has a very satisfying array of games to choose from in their digital poker room. They offer low, medium, and high stakes games with fixed limits, no limit games, and pot limits. They offer variations of all five of the following games: Texas Hold’em, Omaha, Americana, 7 Card Stud and 32 Card Draw. The games are powered through a strong software solution developed by Connective Games and offers advanced features and functionality as well as high quality graphics. We describe the software features a little further down on the page. The competition is fairly soft at Betonline with a lot of fish in the water, which is often the case at sites that offer other gambling platforms, drawing a lot of new poker players from their casino and sportsbook. These new players are attracted to the low stakes games, and they are often willing to gamble more, which is good news for experienced grinders. Arguably the most exciting way to play online poker is within the tournaments that are offered. With the $5,000 New Player Freeroll your initial deposits made from Friday to Sunday will earn you a ticket to play at the next week’s tournament where you’ll have the chance to win up to $5,000 dollars. BetOnline offers various tournaments that will accommodate all play styles and bankroll sizes. “Sit ‘n Go” tournaments are usually with 6-10 players that have fixed buy ins and take between 20-60 minutes if you’re short on time. “Bounty” tournaments reward you for eliminating other players to add excitement to those friendly rivalries. Every weekend with BetOnline you will have the chance to enter into a series of guaranteed tournaments where the overall payout is guaranteed to be $100,000 dollars. There are also other promotions and tournaments like the “$10,000 Weekly Cash Race” where you can win a hefty chunk of money by ranking among the top players for that week. With the leaderboard challenges, Sit N Go, bounty and guaranteed tournaments, BetOnline deserves recognition for their place in the online poker industry. When I first opened the BetOnline poker software the first thing that I noticed was that it had a counter in the top left corner for how many players were online, how many tables were open, and how many tournaments were going on at that exact moment. Over 900 players were on with over 120 tables and even more tournaments. The software is reliable and extremely easy to use. Only moments after opening it for the first time I was able to navigate it thoroughly and find the different variations of each game in each of the set limits that they offered. In 2016, BetOnline did a major overhaul of their poker software client, and have replaced the old system with a much more robust, attractive and feature rich option. The BetOnline online poker software they now use is created by Connective Games and is updated on a regular basis. Connective Games uses a Random Number Generator that is tested by Gaming Laboratories Industries (GLI) to have unswervingly met industry standards in statistical randomness for their highly-scrutinized jurisdictions. The new software offers improved graphics, is both PC and Mac friendly, and offers well designed player tools such as being able to check hand history, the ability to resize and play at multiple tables at once, switch between two room styles and use a custom avatar. You can also use their buddy list feature that allows you to manage a friends list of people you enjoy playing with, fish you want to follow as easy prey or rude players and sharks whose tables you’d prefer to avoid. They have added a host of customization features and some really savvy tools such as a time bank for helping players make critical decisions or allow you to mess with the other players. BetOnline has been around since 2004 and their parent company has been doing business since as early as 1991. The long-lasting reputation of reliability and financial responsibility has led to an uncompromising trust in their safety and security protocols. They employ the latest in SSL data encryption technology on their financial servers and employ a team of professionals to monitor their servers for any potential malicious attacks on your personal information. The BetOnline’s banking suite can be found on their website or through the software that they offer. Their deposit methods are: Bitcoin, Visa, MasterCard, American Express, money transfers through Western Union and MoneyGram, bank to bank and book to book wire transfers are accepted, they will also take money orders and cashier’s checks as well and you can even use the “BillPay” function in MoneyGram. For payouts you can choose to transfer your funds to other portions of their website to use in sports bets or racebook bets, or you can choose one of their payout options. Bitcoin, MoneyGram, check by courier or bank wire. Each of their payout options have different wait times and fees associated so we encourage you to read the fine print before making any decisions with your payouts. Since the early 90’s, the parent company to BetOnline has been perfecting their ability to deliver the best online betting experience that they possibly can. Through the online poker boom in the 90’s and early 2000’s they have managed to create a website that is stunning and streamlined and really drives the Vegas theme home. Their software offers smooth gameplay that is fast and reliable and easy to download and install. Their game menu is strong and with the 5 major types of poker they also offer the different variations of fixed limits, no limits, and pot limits. The bonuses and promotions are many and the tournaments add extras for added layers of fun with the age-old card game now adapted to the internet. 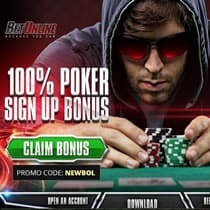 With the promotions and bonuses, the streamlined technology, long standing reputation of reliability and smooth and easy-to-use software, BetOnline as earned its place among the top poker sites in the world.